In 1985, the video game world was forever changed by the release of the Nintendo Entertainment System (NES). This system splashed on to the world with a whole host of games that forever changed the lives of children around the world. In Japan, the Famicon system had been on the market since 1983. This system was later rebranded and bundled with Atari software as the NES. It was to include Donkey Kong, but a dispute with the game maker Coleco lead to Donkey Kong not being initially released on the NES. The Nintendo offered enhanced graphics and vivid 8-bit colors which was a major upgrade to home gaming systems prior its release. Originally, Nintendo released the AVS or Advanced Video System in 1985, but this was not well received and was a failure for Nintendo. Nintendo later renamed the AVS as the NES and bundled it with a robot and a light gun. Games included Gyromite and duck hunt. This was a little better received versus the AVS, because the robot and the popularity of toy robots made this NES a bit more attractive. However, Nintendo used door to door sales of the NES to business and toy shops in New York City which lead to some popularity and eventually lead to Nintendo partnering with department store chains by bundling bulk orders of popular toys of the day, such as Teddy Ruxpin, with bulk NES Systems. The other factor that led to a great success was the development of the Super Mario character which came from Donkey Kong. The following year, Teddy Ruxpinâ? 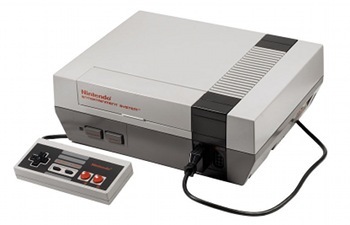 ?s popularity faded, but the NES was the hot ticket item of the year. However, it has been said that Teddy Ruxpinâ? ?s popularity that year caused Nintendo to rise to the house hold name it is today. Nintendo’s first rivalry was with the Sega game systems. It lead to a healthy competition which lead to second generation systems with better graphics and better software development. Eventually, the rivalry was complicated by further generations of systems like the Sony Playstation, and the Microsoft Xbox systems. These systems were offering DVD quality technology and CD quality sound as well as true video playback. However, Nintendo continued to push forward and develop family friendly games with well loved gaming worlds such as Super Mario, Zelda, Mega-Man, and the Pokemon gaming series. The portable gaming scene was greatly impacted by Nintendo with its line of portable gaming systems starting with the Nintendo Gameboy which was a black and white hand held device. This device had a long battery life which gave it an edge over the color gaming systems of the day such as the Sega Game Gear. Nintendo also combined touch screen technology with a portable gaming system in the Nintendo DS which was a huge success. Nintendo made another huge impact on the gaming industry in 2006 with the release of the Nintendo Wii. This was a console with a motion sensing controller which got gamers off the couch and into the middle of the room. This motion sensing controller lead to a series of dancing games and exercising games that got parents involved in the gaming alongside their children. However, the motion sensing technology was soon edged out by Microsoft Xbox 360 Kinect optical technology which requires no controller at all by sensing the gestures and motion of the user via a camera accessory. The current generation device is called the Nintendo Wii U which uses a controller that combines a video touch screen with a controller and motion sensing technology. This interactive controller provides a level of immersion that is not quite matched by any of the current gaming technology on the market. Nintendo is sure to continue making an impact on the gaming industry with innovations and original technology to provide great fun for gamers for years to come. Click here for the best classic console guide available . . .